A selection of some of the chocolate Denise bought, as she’s already eaten some of it. Our magical holiday discovery for you, our Christmas present to ourselves and you, is the discovery of Dancing Lion Chocolate in Manchester, NH. A few weeks ago, we went to a Science in the Pub lecture in Manchester on the Science of Chocolate. It was cool — we are both pretty nerdy, and science of food is something that there should be more of in the world. There were graphs and discussions of the crystalline structures of chocolate and a discussion on tempering it and the different factors that affect cacao production as well as the history of it. The speaker was Rich Tango-Loewy of Dancing Lion Chocolate, which is a high-end chocolatier in Manchester, NH. Denise e-mailed him the day after about her allergens in hopes that, since he knows absolutely everything about every ingredient he uses, that he could tell her if any of the chocolate was safe for her to eat. He was super-helpful (see Denise’s review below). We had plans to go in and see what they had, but the mega-blizzardpocalypse hit, and we had to delay. They do “traditional” drinking chocolate — old-school hot chocolate. It’s cooked longer, uses the whole chocolate (so the cocoa solids, but also the cocoa butter) and therefore doesn’t need milk. It is mind-blowingly amazing, and rather magical. The Mayan Dark contains cinnamon and cayenne (and soy lecithin, for anyone who has a concern about that — it is non-GMO soy from Europe. Soy lecithin does not appear to be a problem for me at this time). The cocoa butter melts out and turns this beverage rich and creamy without the addition of dairy. Dancing Lion serves it frothed in bowls, as is apparently traditional. The bowls are pretty perfectly sized to warm your hands up, which is just an added bonus to an already great experience. This hot chocolate will make your day. Maybe your week. Besides the drinking chocolate, I took home bars of the Tango and Limone chocolates (the latter is the same as the Axiom, but contains lemon rind). At the moment, I haven’t opened the Tango (67% dark chocolate), but have done grave damage to the Limone (60% dark chocolate), which has tiny crunchy bits of citrus that just makes the chocolate flavor deeper. If you’re ever in Manchester — or if you’re not and instead just have an internet connection — Dancing Lion Chocolate is worth checking out. Your taste buds will thank you. As Mary Kate has said above, after his talk, I contacted Rich about the possibility that he might have chocolate that’s safe for me. Since Rich’s focus is on artisanal chocolate, which is not mass produced, I thought there would be less of a likelihood of cross contamination for corn. The reason that I’ve been trying to make my own chocolate is that I’ve reacted to some mass produced chocolate that has no corn ingredients listed on the label, but appears to have been cross contaminated as the result of the manufacturing process. The “chocolate” (i.e. cocoa powder, cocoa butter, and cane sugar syrup mix) I’ve been making is sort of passable, if you absolutely can’t get anything else, but it’s not really chocolate. Also, it starts melting at room temperature, and I have to keep it in the freezer, which does not bode well for the possibility of making chocolate chip cookies. Rich was well-informed about food allergies and let me know that if my allergies were life threatening, he couldn’t guarantee that the chocolates would be safe as they do use dairy, eggs, coconut, almonds and hazelnuts in the shop and there could be cross contamination, even though they clean and sanitize carefully. Rich said that his Tango and Axiom custom-blend chocolates contain only cacao and sugar. Since most of my allergies don’t fall in the anaphylactic bailiwick (and hopefully they never will), I had to give it a try. When I arrived at the shop, I let Rich know that I had emailed and he asked questions about my allergies, and pointed me to the chocolate I could buy to try. I found that I had the choice of 5 custom made chocolate bars, some drinking chocolate, some baking chocolate and a shimmer (a little sample of chocolate, smaller than a bar). I was ecstatic. When Mary Kate arrived and Rich let us know that we both could get Mayan Heat Drinking Drinking Chocolate, we ordered some. After tasting it, seriously, I could have cried. I mean, chocolate, cayenne, and cinnamon, how could it not be perfect? When I left, I had managed to purchase a bar of Tango, a bar of Axiom, and a Cacao Tao bar. The Tango and Axiom bars are custom-blends of cacao and chocolate, and the Cacao Tao bar is created from the Tango blend with cacao nibs and blueberries. 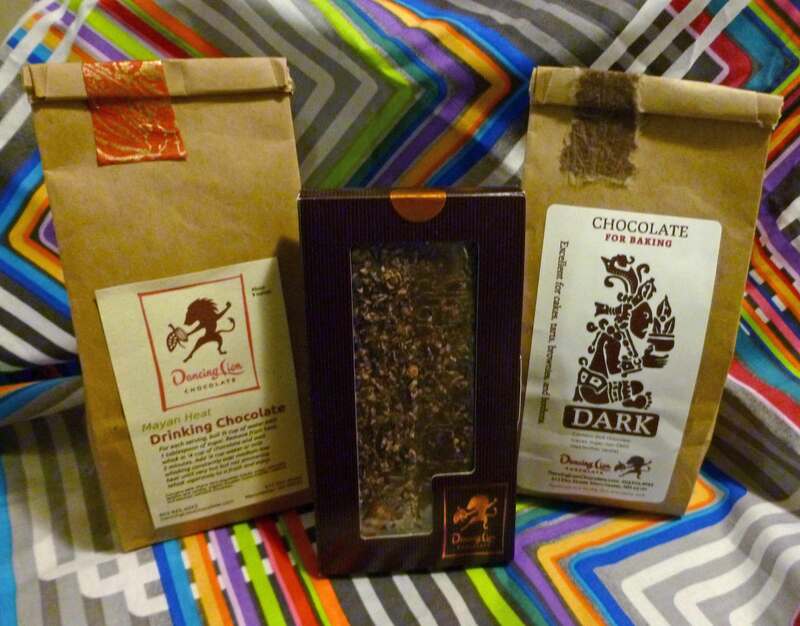 I also got an Axiom and candied ginger shimmer, some Mayan Heat Drinking Chocolate, and Dark Chocolate for Baking. So far, I’ve eaten the Tango and Axiom bars and the Axiom and candied ginger shimmer, with no reaction. I loved them both, but I think I like the Axiom chocolate a tad better. The Axiom candied ginger shimmer was fascinating because the ginger was so candied, it was crunchy. It was really yummy; I love ginger. Dancing Lion Chocolate is only about 4 miles from my apartment. Which is good and bad all at the same time. The chocolate is not inexpensive, but it was worth every penny. If you get some spending money for the holidays, this would be a good place to spend it. This review was not solicited and neither authors have received any compensation. Opinions are our own. it’s a christmas miracle, chocolate for everyone! Definitely a worthwhile miracle. How did we miss this place in our tastings of Manchester? Mexican is a powerful distraction!